The decay scheme of potassium-40 is unusual. The mass energy of atom is above these of its two neighbours in the family of atoms with 40 nucleons in their nucleus : Argon-40 with one proton less and calcium-40 with one proton more. Potassium-40 has two decay channel open. 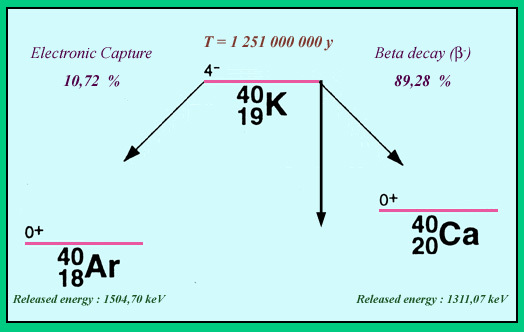 The beta-minus decay channel leading to calcium_40 is by far the most frequent, but decays leading to argon-40 by electronic capture occurs at a rate of 11 %. Quite remarkable also is the very long half-life of 1;251 billion years, exceptional for a beta decay. This is explained by a large jump in the internal rotation (or spin ) of the nucleus during the decay, which almost forbids the transition particularly difficult, therefore making it extremely slow.